2. Sabbath Year - Rest for land. 3. Year of Jubilee - Help for poor; stabilize society. 4. Passover - Remember Israel's deliverance from Egypt. 5. Unleavened Bread - Remember how the Lord brought the Israelites out of Egypt in haste. 6. Firstfruits - Recognize the Lord's bounty in the land. 7. Weeks (Pentecost or Harvest) - Show joy and thankfulness for the Lord's blessing of harvest. 8. Trumpets (Rosh Hashanah-New Year's Day) - Present Israel before the Lord for his favor. 9. Day of Atonement (Yom Kippur) - Atone for the sins of priests and people and purify the Holy Place. 10. Tabernacles (Booths or Ingathering) - Memorialize the journey from Egypt to Canaan; give thanks for the productivity of Canaan. 11. Sacred Assembly - Commemorate the closing of the cycle of feasts. 12. Purim - Remind the Israelites of their national deliverance in the time of Esther. 13. Hanukkah (Feast of Dedication or Festival of Lights) - Commemorated the purification of the temple and altar in the Maccabean period. 14. New moons were also often special feast days. Bible.org's commentary on Leviticus chapter 23 is at this link. New Testament - Mark chapter 9 verses 33-35 always stand out to me and I personally always need to be reminded of Jesus' teaching here in the last sentence - "Jesus asked them, "What were you discussing out on the road?" But they didn't answer, because they had been arguing about which of them was the greatest. He sat down and called the twelve disciples over to him. Then he said, "Anyone who wants to be the first must take last place and be the servant of everyone else." How are you doing on this last sentence? Are you taking last place? Are you the servant of everyone else? Do you think this last sentence applies to Jesus' life? Do you think we should model how Jesus lived his life? I came across an artistic image I liked a lot, below, which kinda sorta applies to verses 36 & 37... except the child is wearing very modern day clothes - keep in mind it is art! 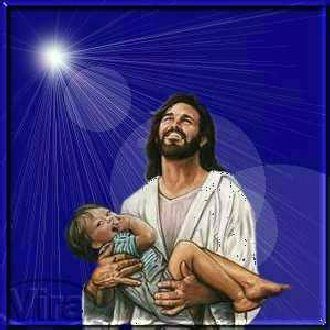 :)- "Then he put a little child among them. Taking the child in his arms, he said to them, "Anyone who welcomes a little child like this on my behalf welcomes me, and anyone who welcomes me welcomes my Father who sent me." Bible.org's commentary on today's readings in Mark chapter 9 &10 is at this link. Psalms - Psalm 44 verse 3 is a wise statement about where the Israelites and our true strength and victory in life comes from - "They did not conquer the land with their swords; it was not their own strength that gave them victory. It was by your mighty power that they succeeded; it was because you favored them and smiled on them." As you look back on your life and at the good things that have happened to you, do you think that these things occurred because of your own power or work alone? Or, do you think it is possible that God's hand was blessing your life through all of those good things - even if maybe you did not notice God was there at the time? What verses or insights jumped out for you in today's readings? Please post up in the Comments section below! Psalm 44:3 We didn't fight for this land; we didn't work for it--it was a gift! You gave it, smiling as you gave it, delighting as you gave it. This verse struck me - reminding me of Paul's picture of we Gentiles being grafted into the spiritual Israel. Thank God for his unspeakable gift!! I haven’t counted how many times in Leviticus that God declares His Holiness to His people, but whatever the number may be it is a lot. God want’s His people to know that He isn’t any ole stone or wood God that He is the God over everything. I’m not sure if it is stated somewhere in the text of the Old Testament, maybe in the Prophets, or maybe I just heard this and somewhere within my spirit it spoke truth, but I believe we become what we worship. If that statement is true then we are transformed by the attributes and the character of that which we direct our adoration and reverence too while in worship. If that is the case then we can see why God spends so much time revealing who He is and what He will and will not accept in worship and in sacrifices and offerings. We can also picture God as a stern taskmaster full of doom and gloom, yet there are at the least nine plus festivals throughout the year celebrating this most awesome God. In the ‘hood some might say that God knows how to throw a party and sometimes the parties are one entire weeklong. Although not listed here, there is a celebration that Jews participate in, at lest the Hassidic and Orthodox Jews do, that celebrates the reading of the Torah. Mike, just like we are doing, they use a plan that goes through the entire Torah in one-year and when they finish, the police shut the streets down in Crown Heights Brooklyn (One of the Hassidic enclaves in Brooklyn) and the men dance in the streets passing the Torah, which is in a special case (it is a scroll), to each other and kissing it. It is a sight to see and one cane become envious seeing the joy that is in the eyes of these religious Jews over the Mosaic Law that they study all their lives. Jesus turns the disciples understanding of greatness and leadership upside down by explaining that to be great, and he doesn’t rebuke them for wanting to be great, is to serve one another: greatness through servant-hood. Just because someone is not part of the “us four and no more” group doesn’t mean they are not doing the work of the Gospel. We live in a society of “gang affiliations” Our gangs may not be the Bloods and the Crips, but they are the church’s we attend, the companies we work for, the folks we “hang” with, the neighborhoods or sub-divisions we call home. But Jesus says that is all incidentals because our afflictions should be based on those lifting up the name of Jesus. Jesus pulls the marriage relationship out of the comparison arena, our comparing longevity, or lack there of, based on the yardstick used by the rest of society. Jesus pulls marriage back to, “In the Beginning …” and God’s original plan, which should be our yardstick. Even though the question about marriage was to be a trap, Jesus gave them more then what they bargained for. The more information one is given, the more one will be held responsible for the information they receive, so in trying to trap they became entrapped by new information. A couple of years ago I told a good friend that he needed to be careful about how much credit he took for his achievements and while we were talking an image of a baby in a car seat that was equipped with a toy steering wheel came to me. Although the baby may think he is driving a car because he has in front of him something that appears to be the car’s actually steering mechanism, yet none of his actions are causing the car to move. We are in danger of being like that baby who thinks all of his actions are directly causing the car to take him to grandma’s house. This Psalm gives us a reality check. This is a warning about the fish story, the one that got away, taken to every area of our lives.